Hey this looks very awesome! Is there a way i can buy some of these from you? Please let me know.You are very talented . Thanks! Well I hold auctions on Instagram - instagram.com/warrenlouwgallery The next one will be at the end of April. 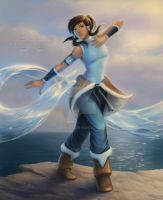 I didn't know I wanted my very own Lil Korra till you presented one to me, Warren! LOL! So this was before she got those muscles huh? "I'm the Avatar, you gotta deal with it!"